The more you ride an old bike, the more its quirks and wrinkles become normal. I realised this today after spending most of it tinkering with the Ural. Urals are possibly the exemplar of quirks and wrinkles. It’s Downton, dear, but not as we know it. I went to retrieve it from its new garage on the other side of the village and, of course, cleaned out the carb float bowls. That’s because they have a nasty habit of filling with water when the bike’s left outside for a while. Easy job. Takes less than five minutes now to have both bowls off, clean them out, replace the gaskets and nip up the screws. Then, of course, it wouldn’t start. Turn key – click. Turn key again – click. Check the lights – yep, battery’s fine. Must be a stuck starter. Open boot, extract biggest spanner in the tool roll. This is the sort of spanner that Ural’s Russian makers would have nicked from one of the USSR’s tank regiments. I whack the starter casing, put the spanner back in the roll confidently and thumb the button again. 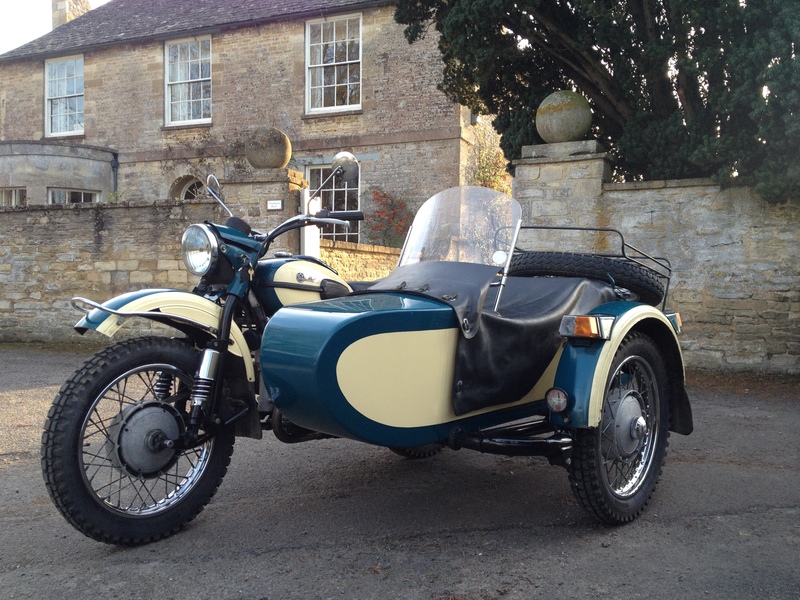 Clacka-clacka-clacka – the wonderful, ‘biscuit tin full of old bolts’ sound that is a healthy Ural. Easy job. Then I ride it home, realising that the left carb is over-fuelling. So I lean down and straighten the control cable. Engine happy again. More clacka-clacka-clacka. Easy job. A few happy hours of cleaning, including removing the exhaust system (glad I copper-slipped the threads) and by the time it’s time to start again it’s dark. I start the bike and casually flick the light switch. Nothing. For behold, darkness shall cover the earth and gross darkness the people. Must be No.1 fuse. So, fusebox cover off, give the fuse a twiddle and replace the cover. Yep, lights working now. Easy job. I remember when my pal Tarka rode down from Liverpool to teach me to ride a combo, four years ago now. We were out practicing when the bike suddenly started running rough and bogging down. Without a comment, he climbed off, toolkit out, and drained the carb float bowls – just as I did this morning. At the time I was terrified. I thought I’d spent a fortune on a lemon. To Tarks, a simple job like this was just part of owning a bike with a bit of character, so why comment when you can twirl a screwdriver and fix it? The more you ride an old bike, the more its quirks and wrinkles become normal. I realised this today after spending most of it tinkering with the Ural. Urals are possibly the best example of quirks and wrinkles. Now I realise that Urals just need a bit of love and care. And the sense of satisfaction from knowing all those little quirks and wrinkles is immense. You don’t get that on a Honda. → Don’t vote. It just encourages them? Wonderful to hear from you again old friend, I trust this means riding season has arrived at last.